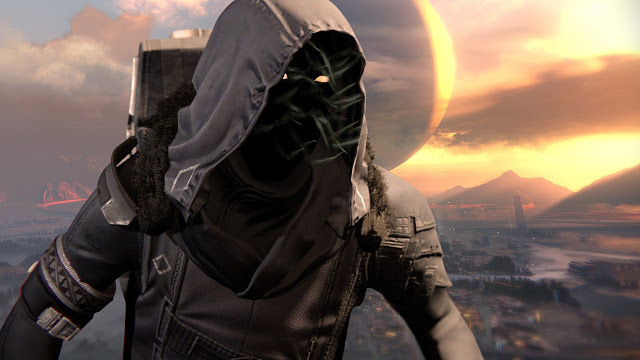 Well this is the last Xur before The Taken King is released but most of the stat and level changes have already taken place. I’m not going to have any recommendations for stat rolls this week as I no long know what the new max is for them. Also should be noticed that Bungie nerfed heave ammo down to 3 for a strange coin instead of 5 and he’s not selling exotic shards….. not cool Bungie. 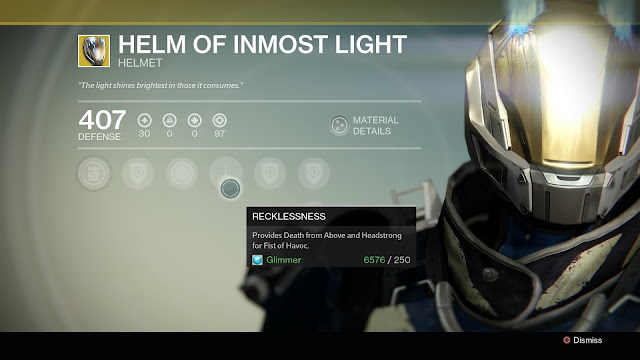 Titan: Helmet: Helm of Inmost Light w/ 34 strength roll: A cool looking striker class helmet that gives Death from Above and Headstrong which is pretty sweet since you can still pick a third perk from the skill tree. It also sports increased melee attack speed and melee cooldown on orb pick up, though melee isn’t the titans strong suit. This is going to year 2 so if you don’t have it I’d get it. 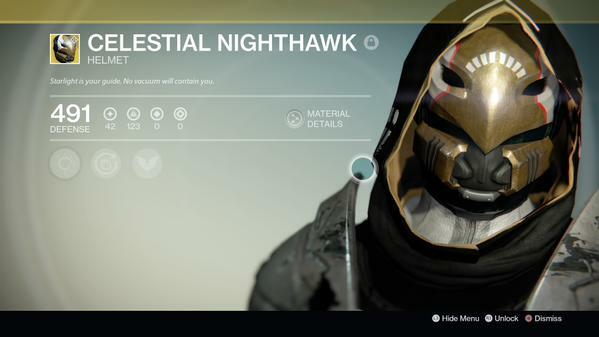 Hunter: Helmet: Celestial Nighthawk w/ 25 intellect roll: The new hunter helmet from House of Wolves is for sale for the first time. Its main perk is Big Game where you get only one golden gun shot but it does 6x damage, fun and great for PvE but stay far away from this one on the PvP side of things. 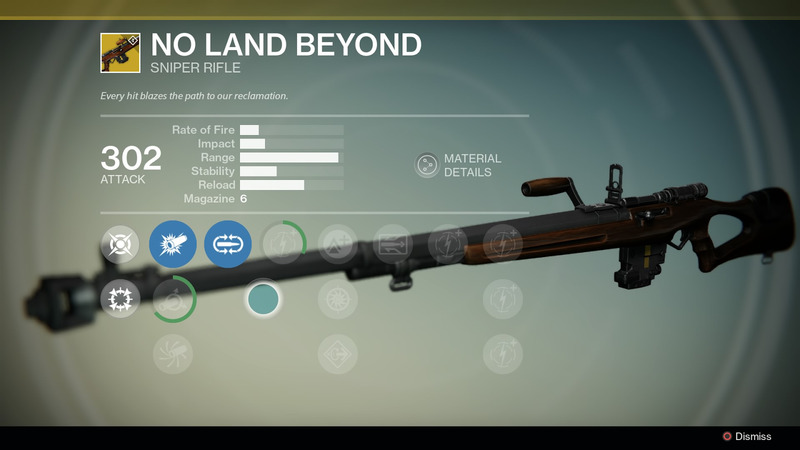 It also has more super from non guardian kills and more super from grenade kills. This is going to year 2 get it. 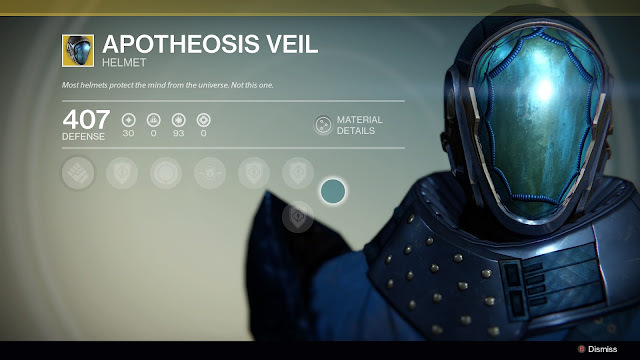 Warlock: Helmet: Apotheosis Veil w/ 32 discipline roll: Like the Insurmountable Skullfort this is an average exotic that does have the health regen with orb pick up. It also regens health when you pop your super which is decent in PVE and Crota. This helmet does go to year 2 so I’d get it. Weapon: No Land Beyond: This is a sniper rifle that goes in your primary slot it’s also a very niche weapon. Most people hate it and never use it but a few people out there swear by in pvp, guess it depends on how good a sniper you are. It however does not go to year 2.